Dominic Raiola apologized and will make a “significant donation” to the University of Wisconsin marching band. He will face no other disciplinary action from the Detroit Lions. The veteran center was accused of using profanity in remarks to band members on the field during pre-game warm-ups at Lambeau Field on Sunday. The Lions’ veteran center called and apologized to Michael Leckrone, director of the University of Wisconsin marching band. 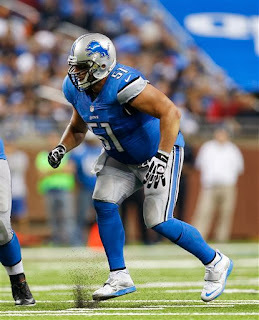 Raiola apologized to Leckrone for his actions, according to a release from the Lions. “My interaction with the Wisconsin Marching Band was inappropriate. I apologize to those I offended along with all of the members of Wisconsin’s Marching Band. Coach Jim Schwartz said that neither he or any of the Lions coaches heard the exchange. “After investigating the matter and discussing Sunday’s events with Dominic, we are pleased that he has taken ownership of his actions and admitted those actions were wrong and unacceptable. “As we said yesterday, his actions were not reflective of the standard of behavior that we expect from any player or any member of our organization. “We are also pleased that he is supporting his apology with a significant donation to the Wisconsin Marching Band Fund. Raiola’s brother Donovan played football at the University of Wisconsin. In 2008 and 2010 the Lions fined Raiola for inappropriate interaction with fans.